Everyone had the same hilarious comment. Long gone are the days when Lady Gaga has to wear meat dresses to get our attention. Gaga is all grown up and hanging out with Tony Bennett (for some reason) but that doesn't change the fact that she's still going to bring the quirk on occasion. 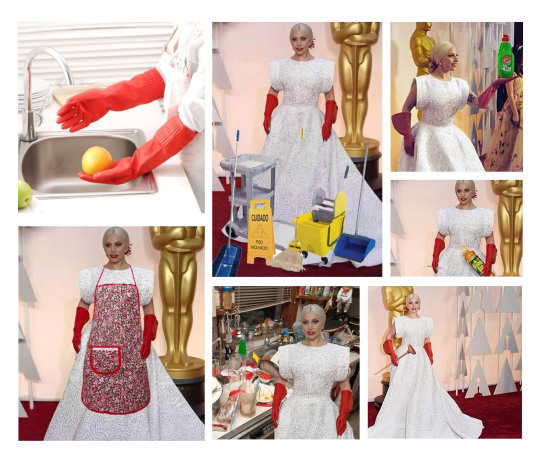 That would explain why her sparkling white red carpet gown was accompanied by, what looked like, red dishwashing gloves. She was the Belle of the Ball with her insanely good Sound of Music medley but before she took the stage she was sporting some seriously bold hand wear. Twitter and the internet as a whole basically had a field day with her outlandish accessory. They bought her a one way ticket to Memeville and basically could not and would not stop. Some people even thought that she was *ahem* scaring all the guests away. While others didn't want anyone shading the Queen. But when it came time to perform, the gloves were off (so to speak) and Gaga put on one hell of a show.